How can I change the administrator, Windows 8.1 / 10 (user account)? It is quite easy to change the administrator user on Windows 8, 8.1 and Windows 10! You can do this via the User Account Control in Windows 8.1 and/or Windows 10 Control Panel. Or, open the Windows 8, 8.1 eg Windows 10 Control Panel and click on (open) Manage accounts. click on the text "Manage another account" (... see Image-1 Arrow-1)! It is easy to switch the standard user to administrator account for admin rights and access privileges! How can I change the administrator, Windows 8 (user)? 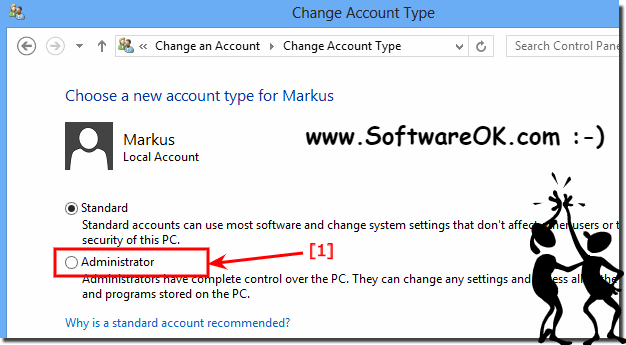 in "\Manage Accounts" Window click on new Administrator for example Markus (see Image-3 Arrow-1). Manage Accounts, Windows 8 (user)! And now click in the Window "Change an Account" the text "Change the account type" (see Image-4 Arrow-1). The last step Change Account type (e.g. Markus), to the Administrator (see Image-5 Arrow-1). Whether you sign in to your PC with an email address (to access your Microsoft account) or a user name and password, for everyday tasks, it's best to use a standard account. A standard account can help prevent people from making critical changes, such as deleting files that are required for the PC to work. You can create a standard account for each person who uses your PC. When you're signed in with a standard account, you can do almost anything that you can do with an administrator account. But if you want to do something that affects other people using the PC, such as installing software or changing security settings, you might be asked to enter a password for an administrator account. 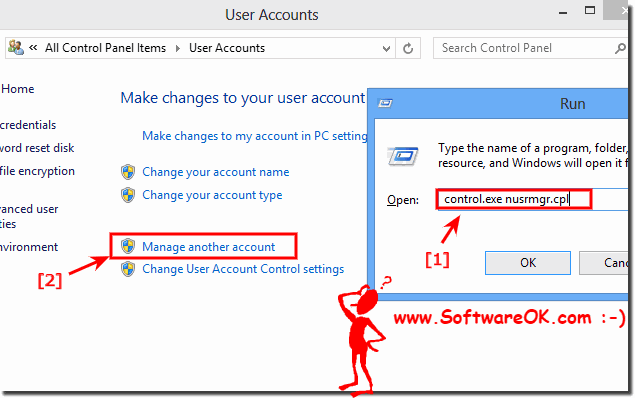 Windows-8 - FAQ-85: How can I change the administrator, Windows 8.1 / 10 (user account)? View and delete partitions on Windows 8.1 / 10, how to? You can open the Program Files folder quickly with the MS explorer in Windows 8, 8.1 and 10, here are some easy example Info: Content / Solutions: 1.